Thanksgiving is a time for family, good food, compassion and thanks. It's important not to leave your pet out this holiday season. Show your pet appreciation this holiday with these 5 Thanksgiving treats for your pet. 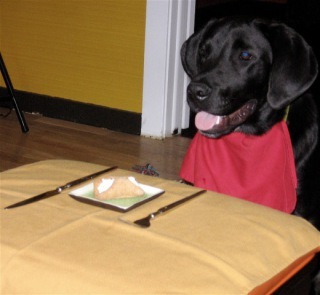 Your dog will love this delicious homemade Thanksgiving treat. Give your pup an alternative to the traditional Thanksgiving dinner with this yummy dog biscuit. 2 cups cooked, whole grain rice. Preheat the oven to about 375 degrees, and begin mixing all ingredients in a large mixing bowl. Form the shape of a large dog bone and place on a baking sheet. Place in the oven and bake for about 45 minutes. Take out, cool, and serve. Thanksgiving turkey nibblers offer a clever way for your cat to join in on the feast this Thanksgiving, without overloading him with fatty, greasy foods that could be potentially harmful. This recipe is also great for any leftover turkey, and can be fed to dog's as well. 12 strips of dark turkey meat, thinly sliced. Preheat the oven to 300 degrees and spray a cookie sheet with nonstick spray. Carefully remove any fat, skin or bones from the turkey meat as they could be harmful to your cat. Cut the turkey into 1/2 to 1 inch slices, and place the turkey strips on the cookie sheet. Bake for about 3 hours, keeping a close eye on the meat to make sure it doesn't char or burn. Turn the oven off, and leave the turkey inside for 6 to 8 hours until it completely dries. These tasty homemade doggy treats are perfect for Thanksgiving, and a couple can be fed to your dog during festivities for his own personal little feast. 5-6 oz. cooked turkey breast, boneless and skinless. 1 large baking potato, skin included and cut into quarters. Preheat oven to 350 degrees. Add ingredients to a food processor one at a time, pulsating well with each addition, and then stir mixture by hand. A blender can also be used if no food processor is available. Once completed, the mix should be thick and pasty. Coat a muffin pan with cooking spray, and spoon the mix into muffin cups as evenly as possible. Bake for 40-45 minutes. Once completed, let cool, and flip pan to release the treats. This Thanksgiving treat for picky cats will leave your cat feeling satisfied and happy during the Thanksgiving feast. 1/2 cup cooked turkey, finely shredded. 2 tbsp. all natural, unseasoned canned pumpkin. 1 tbsp. finely grated carrots. Place all ingredients in a food processor or blender and puree for 20 seconds. No cooking necessary, feed a tablespoon or so (a teaspoon for a kitten) to your cat. Can be fed from a spoon or your finger, or mixed into your kitties food. This treat can be stored in an airtight container in the fridge for up to a week. Wondering about treats for your small pets this Thanksgiving? Most smaller pets such as some rodents and birds, can't eat meat. Some great treats for these little guys might include raw vegetables like carrots and broccoli, cooked sweet potatoes, cranberries, pumpkin, green beans, and peas. Thanksgiving is a time for celebrations and thanks. 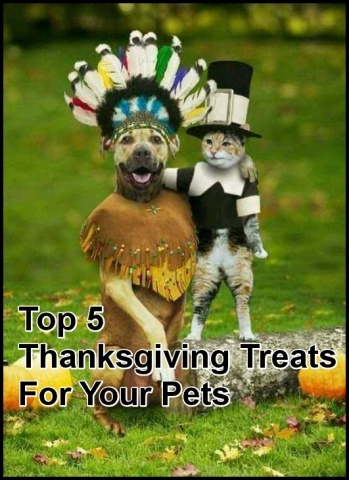 Don't forget to include your loving furry companion with a nice Thanksgiving treat! This Is One Talented Sheepdog! The Saint Patrick's Animal Video Of The Day!! !